Yesterday, at the end of act one of Eric Laufenberg's new prodcution of Parsifal. I applauded louder than perhaps I have done for a long time at a Bayreuth production. What I had been presented with was a production of high, dramatic, musical standards, a superb cast, a conductor whose "late substitution" had managed to bring out the best of the performers and orchestra. An unusually fast pace that, at least this once, also helped the production (this is not a “Buddhist” or even Schopenhauerian interpretation of the Parsifal). And of course, the always amazing Bayreuth chorus. (I shall listen to it again shortly to reassess my opinion but there it is for now). The production itself brought little new to Wagner's work but this is not always a bad thing – and it was dramatically convincing. Alas , in places, there was a little too much of the"provincial theatre" about it (the 2001 AD A Space Odyssey video comes to mind - and while enjoyable, reminded me of a student production) but this is something that can be worked on. Nevertheless, it remained, relatively faithful to both text and score. However, it was from act two onwards that I became increasingly“uncomfortable” and this continued to the end – although among people here, I am not in the majority. In the second act, the production seemed to do everything in its power to be insensitive to the religious sensibilities of Islam - although I am not convinced that was Laufenberg's intention. However, in trying to “shoehorn” his concept into Wagner's work, in the heavy-handed manner that he did, this was inevitable - and occasionally cringeworthy. And once Parsifal became an "Western" Marine, further readings of western dominance and hegemony across the none western world became inevitable in act 3 – if again untended. Is it a good idea, no matter your intentions, in these strange times (or any time), to have a tall, blond, blue eyed, “western” man on a the stage of Bayreuth who proves to be the saviour of all races and all religions? Who shows them all, how “dangerous” and irrational their religions are? A man portrayed in act two as an American Marine, who sublimates a Muslim Klingsor, using the power of the Christian cross to bring him and his empire to heel – care of Peter Cushing and Christopher Lee in Hammer Horrors first Dracula film? If nothing else, this displays an incredible nativity. 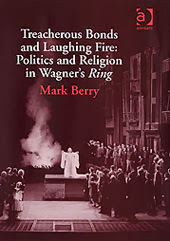 Laufenberg's conclusion, in act three, was one that some readers of Wagner's work and writings, might think corresponds with Wagner's thoughts. In this interpretation, humanity must put aside all religions, being tools (in Wagner's terms - influenced by the young Hegelian's - one of his much hated “ancient contracts”) of control. Its “trappings and symbols being nothing more than “empty edifice”. In the end of the production, the cast throw away all of their religious “trappings” - Muslim, Jew, Christian, Buddhist, Hindhu into a coffin. This might remind us somewhat of Wagner in Religion and Art, wherein he said “Religion has sunk into an artificial life, when she finds herself compelled to keep on adding to the edifice of her dogmatic symbols”. On first view, this is what Laufenberg's Parsifal seems to say, but in the final act it does nothing to replace these - something that I think Wagner would not have agreed. Indeed, would he have been happy with the dismissal of these symbols out of hand? This of course, might be my reading of his production. After all, what was all of that vegetation in act three? A return to “nature”? Who knows. And this maybe the problem. To me, the production provides no alternative. At this stage, and after only one performance, I cannot help but feel that this is a Parsifal for the “Richard Dawkins” generation. 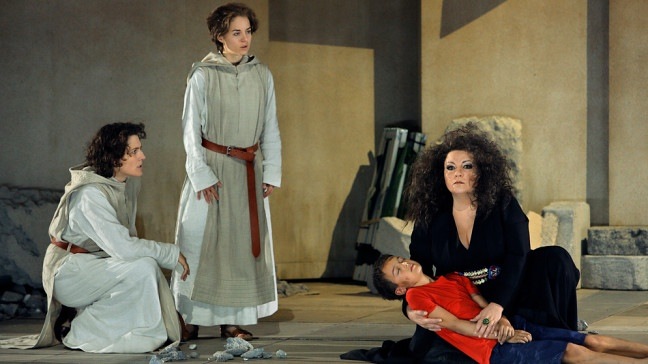 A Parsifal that freely mocks and ridicules traditional (and perhaps future) spiritualities – and is happy to blame them for the worlds failures, rather than on those that would use and abuse them for their own means. In this view of reality, there is no value in religious symbology or more importantly, in spirituality. It is a childish plaything, a throwback to more primitive times and thinking. “ONE might say that where Religion becomes artificial, it is reserved for Art to save the spirit of religion by recognising the figurative value of the mythic symbols which the former would have us believe in their literal sense, and revealing their deep and hidden truth through an ideal presentation. Whilst the priest stakes everything on the religious allegories being accepted as matters of fact, the artist has no concern at all with such a thing, since he freely and openly gives out his work as his own invention. But Religion has sunk into an artificial life, when she finds herself compelled to keep on adding to the edifice of her dogmatic symbols, and thus conceals the one divinely True in her”. To see our way clear in this, we should have most carefully to test the origin of religions. These we must certainly deem the more divine, the simpler proves to be their inmost kernel. Now, the deepest basis of every true religion we find in recognition of the frailty of this world, and the consequent charge to free ourselves there from. ...accordingly the most successful work of the religious Founder consisted in the invention of mythic allegories, by which the people might be led along the path of faith to practical observance of the lessons flowing from the collective unconscious.